Good luck - envious ! Camping is cheaper than therapy. "Wanna sell it" "Yeah, but there's a national shortage on 'for sale' signs." I wanted to install it, but first had to sort out the window scrapers and 1/4 vent rubbers. Each time it rained, water was pouring into the doors. hi tel us how you covered and fasten the door pannels? I still need to cover mine. I drilled 10mm holes like the original template and used the original clips. There were some clips that broke and I got replacements from Volkspares. I also replaced the inner doorhandles window winders with new ones. 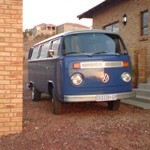 Andries Groenewald was so kind to take off the kickpannels off his bus so that I can make templates. Thanks Andries, you saved me a lot of time! didi wrote: I drilled 10mm holes like the original template and used the original clips.! I am in Cape Town at the moment. I plan to continue working on the bus next week when I am back home. It has to be ready for the KKK campout in Feb. There is still lots to do. I will post as soon as any progress happens. louisvr45 wrote: hi tel us how you covered and fasten the door pannels? I still need to cover mine. When i done my interior i re cut all of the panels out of masonite used the original clips on the front doors couldn’t find new ones anywhere and i replaced most of the clips on the other panels with other straight clips. i put a thin foam and then material and stapled it around the edges at the back with the shortest staples a could . Sorry i didn’t take pics at this stage of my restoration only got a pic of how it looks now. didi wrote: I am in Cape Town at the moment. I plan to continue working on the bus next week when I am back home. It has to be ready for the KKK campout in Feb.
Where about in Cape Town - planning any trips to the Paarl area - pull in for a cuppa ? I got the rear taillights working tonight. You must be so proud to have rescued her from certain demise and in the not too distant future she will be cruising the streets and helping you and your family on many adventures.... Truly awesome ! Thanks for the kind words guy's. It feels like I'm finally getting there. I made a place for the spin on oil filter just behind the mudguard where it's out of harms way from rocks.